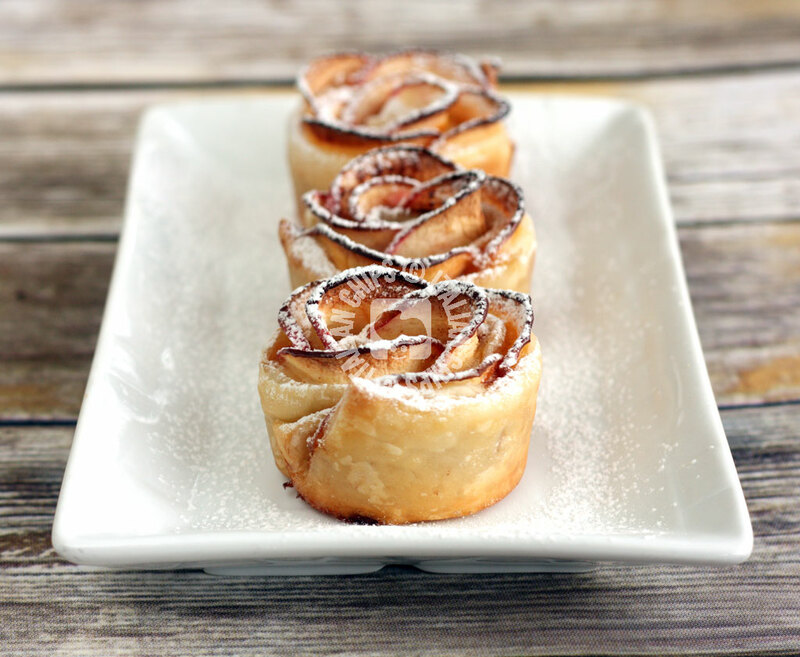 I fell in love with this enchanting apple rose tart recipe. It is so lovely that I couldn’t wait much until trying it. 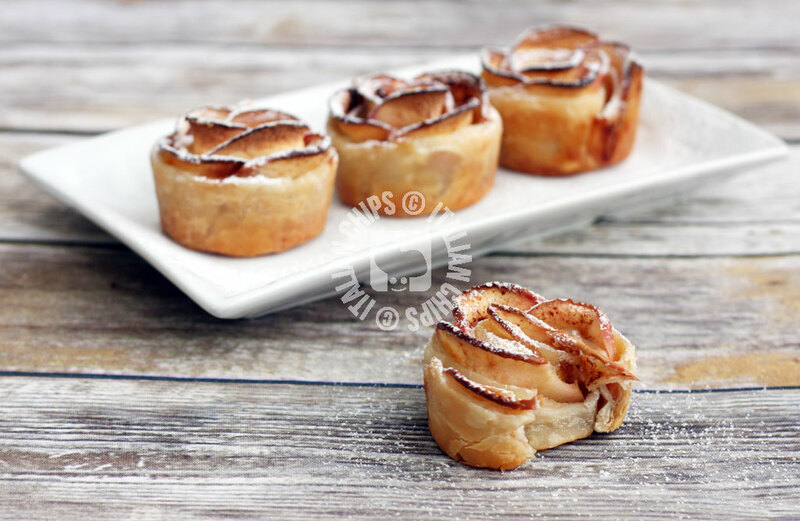 This apple tart recipe has many advantages: other than having a few ingredients, it is pretty easy to prepare, can be a cute idea for a dessert or even ate as a snack. I saw it in a video in Facebook from Cooking with Manuela. 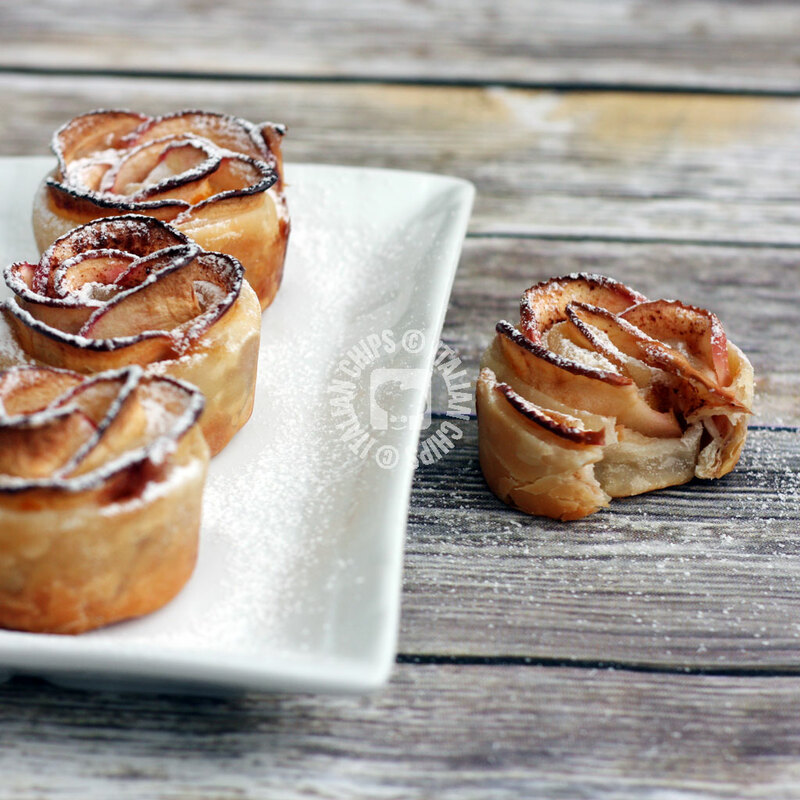 I am adding the video down here (right before the recipe) because I couldn’t explain better than her the easy process of preparing these lovely apple rose tartlets. I would add that the apples have to be sliced as thin as possible, and I needed a longer time in the microwave. 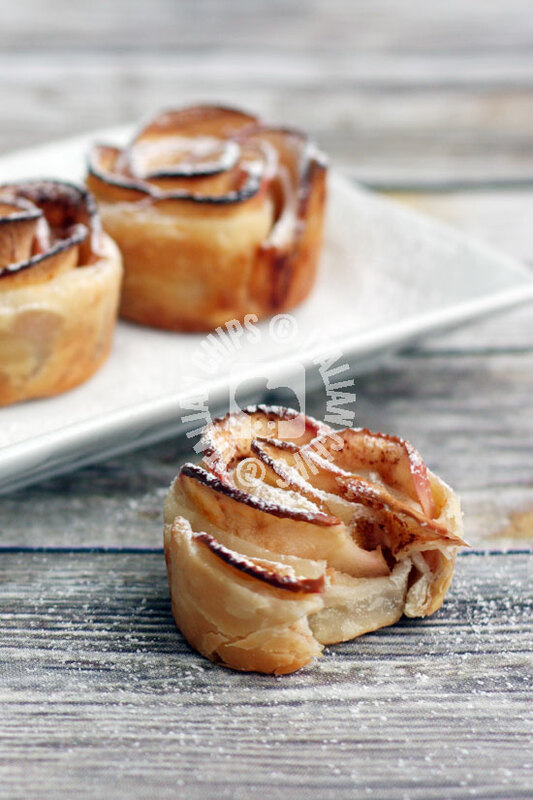 The trick is: microwave them (for me at least 7 minutes, it will depend also on the apples and how thin they are sliced) until the slices are soft enough to be rolled up with the puff pastry. I ate them as they are, but I believe they may match perfectly with a scoop of ice cream. Wash the apples, cut them in halves and eliminate the seeds and hard parts, but keeping its red peel. Slice them as thin as possible and put them into a bowl filled with water and the lemon juice. Microwave them until soft (time depends on your oven and the apples, I needed 8 minutes). Put the apricot preserve and 2 Tbsp of water into a small bowl and microwave for 1 minute. Stir. Open the puff pastry on a floured surface and roll it out enlarging it a bit but keeping the rectangular shape. Divide it in 6 strips. Tale each strip and spread some apricot preserve on it. Add apple slices occupying half of the strip, with the round part up. 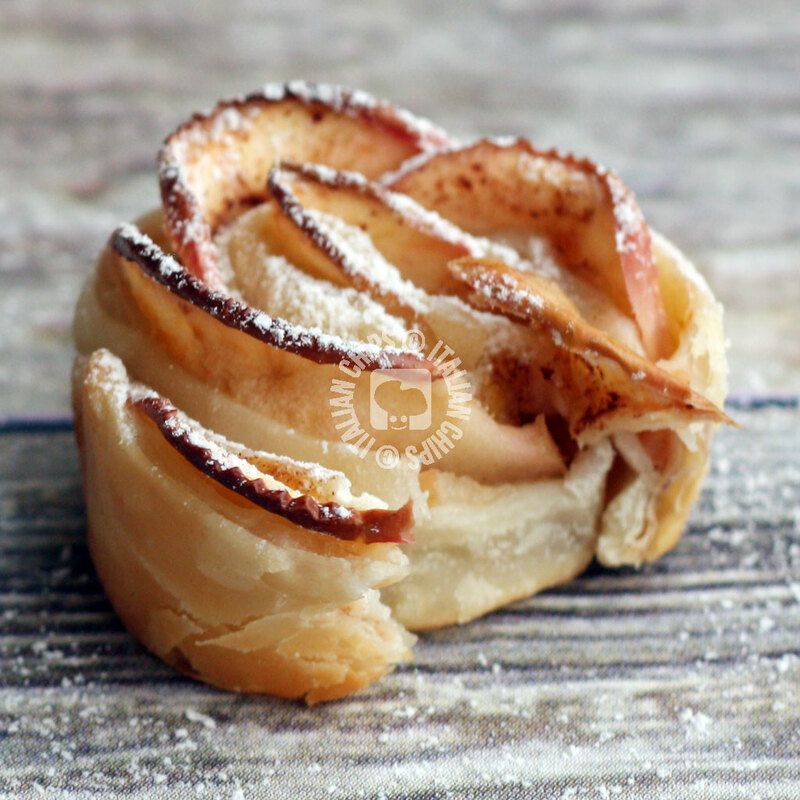 Fold the puff pastry "closing" the apple on inside and then beginning from one extremity, fold it on itself. Put it inside a muffin mold and repeat with the other 5 strips. Bake them for 40-45 minutes. Add icing sugar before serving. Ana amei essas rosas de maçã ,elas tem um lindo visual e devem ser mmuito gostosas. 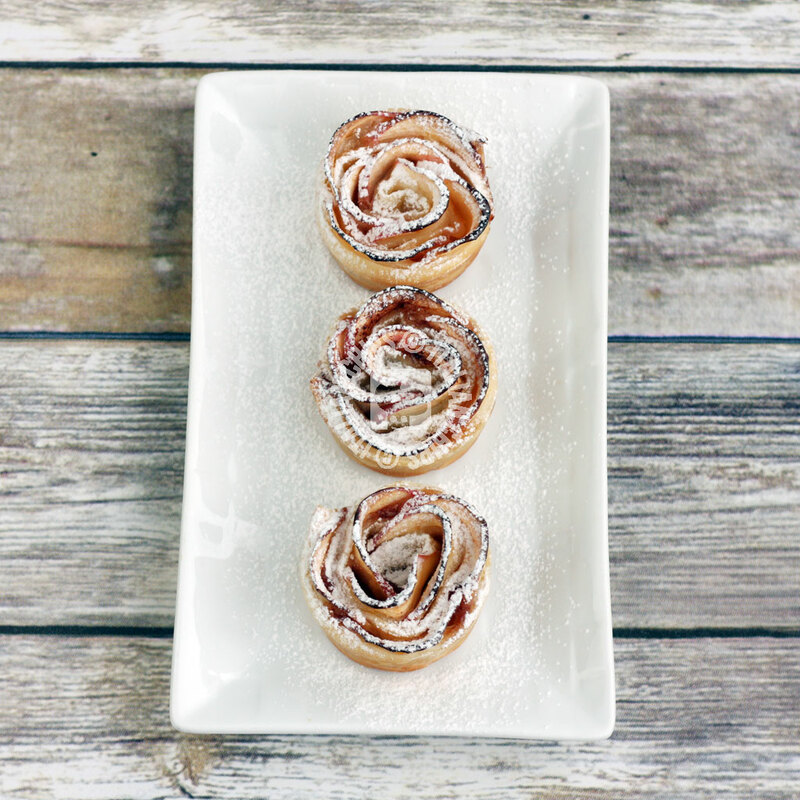 These tarts are beautiful & I love the rose technique. I have to try it!